Posted on May 31, 2018 at 5:32 am. The SOLs roll-on here at WMS — with 8th graders on the Cavalier and Ram teams taking the Math exam. Here’s a look at the testing schedule for May 31st…. 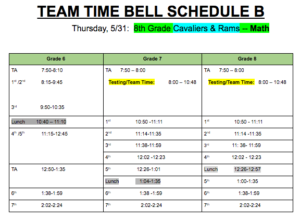 We will be following “Team Time Bell Schedule B.” While the Cavaliers and Rams are testing from 8 to 10:48 a.m. — the rest of the 8th grade and all of the 7th grade will go to Team Time, and the 6th grade will follow the adjusted ‘B’ schedule beginning at 8:15. Testing locations are listed on the call-board by the auditorium, or you can check with your TA teacher. And now it’s time for WOLF PACK PRIDE! There are a lot of AMAZING students here at WMS. And you deserve to be recognized! Teachers from every grade and every team have identified a distinguished group of students to receive this month’s Wolves With Character Award — for demonstrating outstanding PERSEVERANCE in their daily lives. Take a look at the screen to see the deserving honorees. In 6th grade — Freya H., Daniel D., Noor L., Henry N., Qiaojing H., John B., Clara M., Maryam E., and Alexander K.
Congratulations, wolves with character! 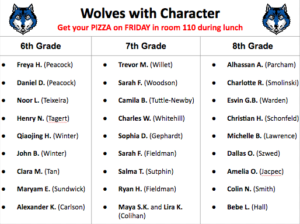 Be sure to stop by room 110 during your grade-level lunch on FRIDAY and pick up your free pizza! WOLF PACK PRIDE continues with WMS Spirit Wear t-shirts — on-sale TODAY after school at the new School Store. They’re just 10-dollars each — and are the perfect “fit” for either next month’s Field Day event or the 8th grade field trip. And there are still a few grade-level t-shirts available, too — for 18-dollars. So come get your gear at the school store today — and be a Part of the Pride! !